Subtitle: I have so many questions. On one hand, I have to give it up to the showrunners because they went for it. There were bold choices made in this episode. But on the other hand was everyone in the story session high? I watched it twice and I am still wondering what did I just watch?? What even happened?? Seriously my notes are 50% question marks. Question 1: Why doesn’t anyone notice Elsa in town? Her look is kinda conspicuous. Like. Sequins. Now, if the rest of the hour wasn’t ???? I might not even mention this. It’s a longstanding Storybrooke thing that no one ever seems to notice anything. But a) Elsa stands out and b) she is not even pretending to try to blend in and c) there was a giant marauding Snow Monster stomping through town like 4 hours ago, maybe people would be on guard against strangers? Especially a stranger who looks like an ice queen?? Maybe??? Someone go write a fanfic about Kristoff or Anna (or both) braiding David’s hair. Question 2: But Joan of Arc is a real person….? 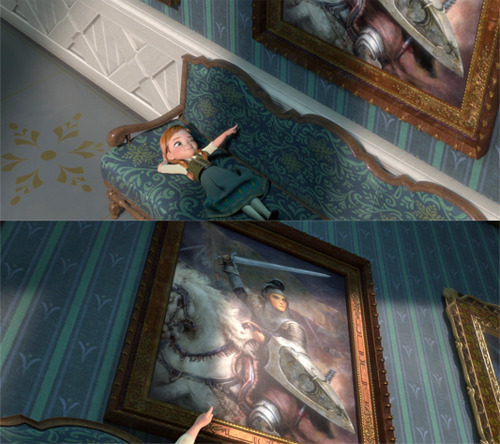 But Joan of Arc is a historical heroine so…is Arendelle part of our world? Like Wendy’s England? Or is there a fairytaleland version of Joan the way there is Mulan? Or, or, what? This isn’t IMPORTANT but I wonder. David doesn’t believe Anna’s name is Joan but figures he’ll learn the truth at her wedding to Kristoff. David: Wow, no one has ever said that about me, can we be BFFs? Anna: Can I sleep in your barn? Anna: Just until I figure out that I need to see Rumplestilskin. David: My barn is your barn. Now, quick, hide, the deadly dangerous warlord Little Bo Peep is coming. Back in Storybrooke, in the Charmings over-full apartment, Baby Neal is sleeping and Henry is filling a basket with ice cream, chocolate, DVDs and …red wine? asks Emma with a raised eyebrow. Henry: It’s for my mom. Emma: I don’t drink and sheriff, kid. Henry: Yeah, if it was for you I would have said “for you” not “for my mom”. Henry explains that he googled how to make a care package for a woman getting over a break up and we all agree with Emma that’s so sweet. 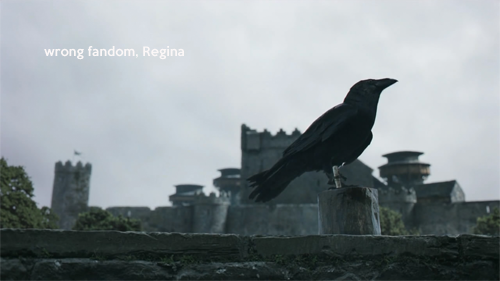 Unfortunately, a crow arrives with a message from Regina that she doesn’t want to see Henry. 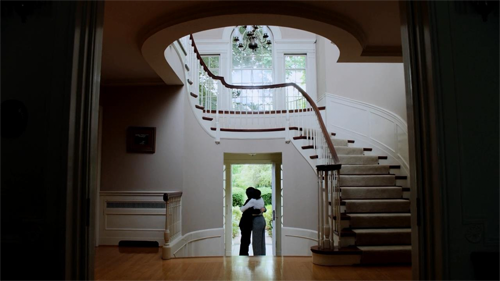 Question 4: Why is this scene at Granny’s? Again, not an important question – lbr, the answer is probably “because there are about 4 people too many living in that apartment and one is an infant” – but I guess we’re to assume Henry ran off to brood and Emma followed him? Okay, sure. So they have a nice conversation wherein Emma makes up for her oblivious response above by defending Regina’s actions and feelings. Meanwhile, Elsa decides to put a snow wall up around the town so no one can leave until she finds Anna. And she knocks out the power. Emma and Charming spring into action. Emma: Wanna come along? We can call it Operation: Nightshade. Henry: The symbol of strife according to the Celts. Emma: How do you learn this stuff? Henry: Nah, this darkness is perfect for my brooding. So, Emma joins up with Charming alone. She’s worried about Henry, he’s closed off. Charming points out that he’s just acting like both his moms, which is really great. As is his advice about kids except…. Question 5: Where did David learn about kids? He put his daughter in a box and shipped her to Maine when she was minutes old and then he was in a coma for 28 years? I guess at the beginning of Season 2, he took care of Henry for idk, a week. So, sure. It IS a really lovely scene. Grumpy, Happy, and Granny appear on Snow’s doorstep to bully her into being Mayor because Regina is too mopey to do it anymore. 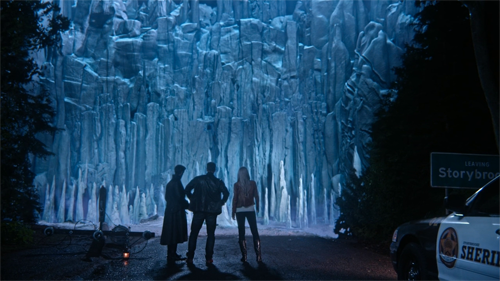 Emma and Charming discover a wall of ice is responsible for the power outage and are joined by Hook who explains the wall goes all the way around the town. So they’re trapped again. As if anyone ever leaves. But sure. 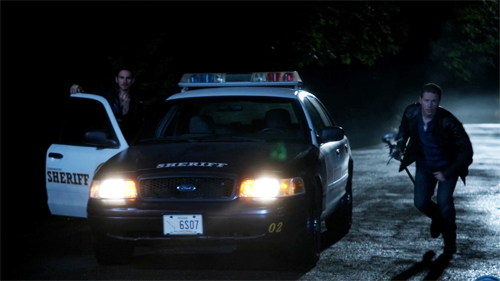 Question 7a: Is Hook going to join the sheriff’s department too? Question 7b: Does Hook count as a Charming now? 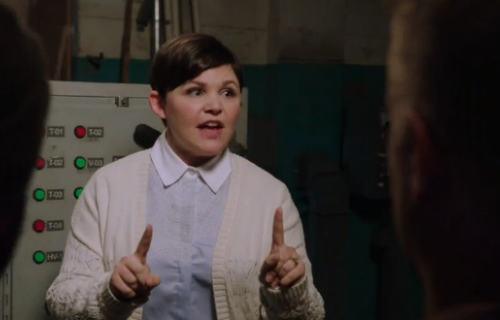 Question 7c: Does Hook live in the apartment with Snow, Emma, David, Henry and Baby Neal? Question 7d: What does Hook wear to do his laundry? Hook’s flirting inspires Charming to ask him about his intentions towards Emma and I yell at the screen that she is a thirty year old woman and that is not cute. Hook’s answer indicates he agrees with me so, yay? Back on David’s farm we meet the warlord Bo Peep. I cannot keep a straight face typing that. Bo Peep: Hey, what up proto-Charming, cough up my fees so I can get back to my flock. David: It was a rough month, we don’t have it. Bo Peep: I’ll take that horse. David: You can’t take my horse. How will I farm without my horse? Bo Peep: I don’t think you understand the extortion process, pumpkin. You have one week or else! David: Let’s just leave, Ma. As long as I have my horse we’ll be ok.
Bo Peep: You can’t leave! And she binds them to her with her shepherd’s crook and flounces away and I just have no words. So Anna comes out of hiding and tells David he needs to stand up to that bully Bo Peep and David counters that she’s not some schoolyard bully she is a warlord with an army and I just have no words! Question 8: Is there a Woody? Petition for Woody to take David’s place at the Sheriff’s so David can go back to his job at the animal shelter. Anyway, Anna volunteers to teach David how to sword fight. Because Anna is aces at sword fighting. Question 9: What even IS this episode? Forward in Storybrooke of the present, Emma catches a glimpse of Elsa and heads into the ice structure to check it out. Elsa gets spooked, the ice wall reacts, and Emma gets trapped on the wrong side of the Fortress of Solitude with a jumpy Elsa. 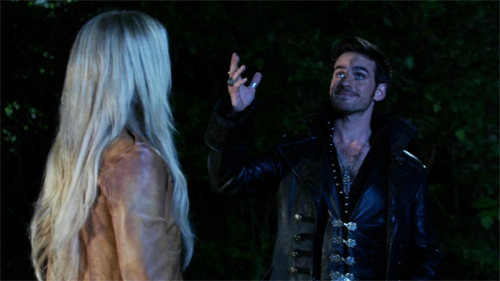 Hook tries to scratch his way in with his Hook and it is laughably ineffective. Back to David’s dancing lessons with Arya Anna. David: I can’t do this. Anna: Only if you give up hope! Anna: It hasn’t even been an hour. David: An hour I could have been working my land or plotting an escape. Anna: You can’t hide from your problems! David: It’s the only way to survive. Anna: Survival isn’t enough, you have to live! David: What do you know about it? Anna explains that her sister tried to shut out the world, too, and accuses him of being a coward. David counters with a heretofore unrevealed tragic backstory about his father who lost his battle with alcoholism when David was six. Anna replies that just because he had a lousy father doesn’t mean he’s also lousy and I feel like I have been waiting the entire series for someone to say that. But I don’t think I needed Charming to have another bad father in order to hear it. 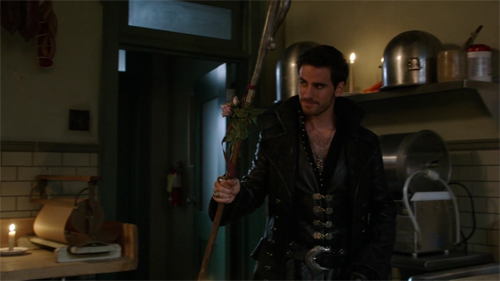 Forward in Storybrooke, Hook tries to scratch his way in with his Hook and it is laughably ineffective. Charming thinks they need magic to fight the magic and they head off to knock Regina out of her Robin Hood stupor. Just kidding! They go to see Rumple even though a) he’s on his honeymoon, b) he requires payment to do anything, c) Regina has about 400 more reasons to help than Gold does, and d) they both get along better with Regina than Gold. Hook and Charming: best at plans. Across town, Snow is trying to fix the power outage but the manual is in Japanese. Question 10: Why is the manual in Japanese? Does Regina speak Japanese? Is the Storybrooke electrician Japanese? If there isn’t a Storybrooke electrician how has this town survived Winters in Maine for 30 years? Maybe it was Regina’s magic and that’s why it is inexplicably the Mayor’s job to fix it now? And I wish she didn’t have to be pushed to the edge by motherhood to get her moment of righteous anger but it was a pretty great moment for Snow. Meanwhile inside the fortress of solitude, Emma, who is freezing, realizes Elsa can’t actually control the ice wall or her powers and they bond over it, which makes limited sense as Emma has never shown particularly poor control, but at this point, I’ve given up on sense. Emma sinks to the ground, too cold to stay awake, and Elsa asks her questions in order to keep her conscious, and alive, and they bond over expectations and lack of parental instruction, which makes way, way more sense and I approve. Charming and Hook burst into Gold’s Shop to find that – shockingly – he is still a jerk who would rather make fun of their feelings than help them out. 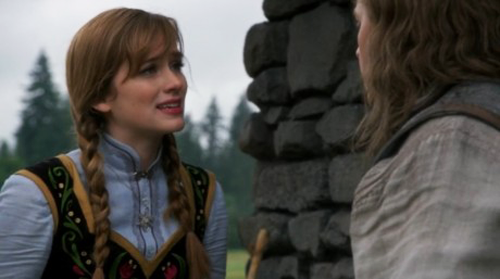 But Belle has a picture of Anna’s snowflake necklace and Charming recognizes it because Anna taught him how to be a hero. 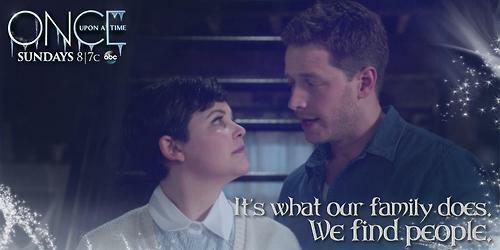 Charming knows where to go next. 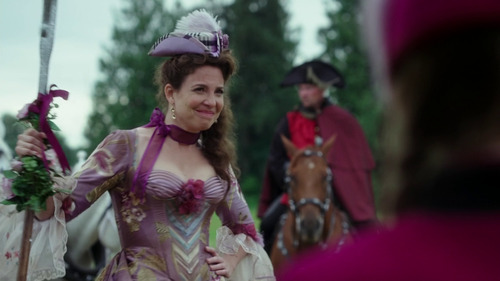 In the past, Bo Peep took advantage of David’s crisis of courage to kidnap Anna. In the present, Bo Peep is Storybrooke’s butcher. Charming and Hook rough her up and steal her shepherd’s crook because they are the good guys. Bo Peep: I can tell you’re a hero now by the way you interrupted my personal business, seized me illegally, conducted an equally illegal search and stole my personal property. Charming: I am the law. Question 11: But isn’t that what hero means? Bo Peep: So in this world you are a ‘hero’. Charming: In this world I don’t have to answer to you. – and but actually, as sheriff at the least but also leader/king/hero he kind of does? Like he is a civil servant and the definition of civil servant is someone who answers to the citizens??? Anyway, Elsa tells Hook over the walkie talkie that Emma is freezing to death so they hightail it back to the ice wall. Back in time, David confronts Bo Peep at her gazebo lair (seriously, what is this episode) and suffice it to say Anna is a really good teacher because he wins the battle. Question 12: Where is Warlord Bo Peep’s army though? Which is against two guards and Peep herself, not the “army” David was whining about earlier but WHATEVER. David uses the staff to find Anna hidden in Peep’s barn. She jumps him because she is a spunky heroine and also because now Charming/Anna (David/Joan) shippers can say they had a roll in the hay and it would be 100% accurate. At the ice wall, Hook tries to scratch his way in with his Hook and it is laughably ineffective. You’d think he would have noticed by now, but you would be wrong. Question 13: Why is Hook so worried? He spends this entire episode worrying about Emma’s health and it’s weird because as he himself has pointed out many times, her life is constantly in danger. But, WHATEVER. 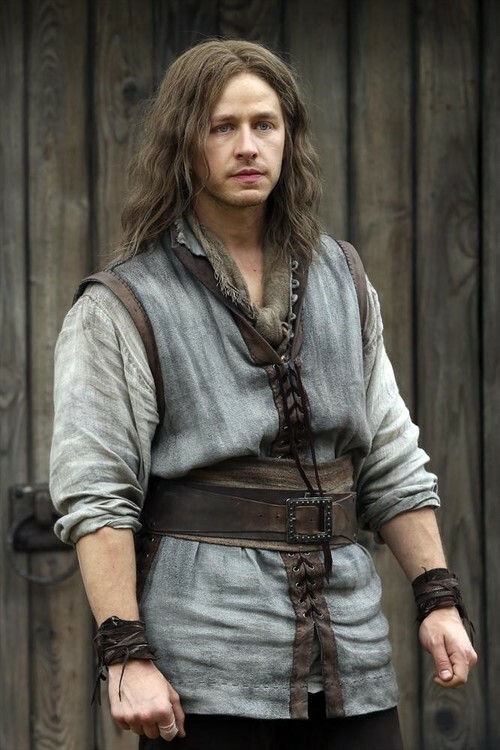 Charming tells Elsa that he has the means to find her sister if she can just get herself and Emma out of the fortress. Charming: Survival isn’t enough, you have to live! Elsa: Where did you hear that? Charming: Your sister! Your sister made me who I am today! Now be who you are and save Emma! Elsa successfully blasts a hole in the ice wall and they get out. Back at the metropolitan electrical grid, Snow finally, finally gets her brains back and solves the problem. Power is restored by Mama Mayor. Back at the farm, David gives Anna the horse he refused to give Bo Peep. It was his father’s horse, but now that Anna has taught him how to be a man, he no longer needs the reminder. And his mother gives Anna the name of the wizard her parents most likely travelled here to see: Rumplestiltskin. “Who saw that coming?” is not Question 14 because literally everyone saw that coming. Snow comes home to find her family using a magic shepherd’s crook to find a strange girl’s lost sister and Charming reminds her that’s what Charmings DO. And it spurs Henry to be the Charmingest he can be by ignoring Regina’s wishes for her own good. Henry: Do you wanna build a snowman? Henry: It doesn’t have to be a snowman. Henry: I won’t give up on you. Ever. Henry: This is my house too! Henry: I miss my room! Henry: Finally. I thought I’d have to sleep on Snow’s floor forever. P.S. Henry is SO TALL NOW. Back at the town line Elsa tries to take down the wall down but nothing happens, prompting her to ask why? She’s not the only ice queen in town. That sure was an episode! What did YOU think?